The StrengThin 100 system ... grooved mechanical solution for joining thin wall stainless steel pipes. 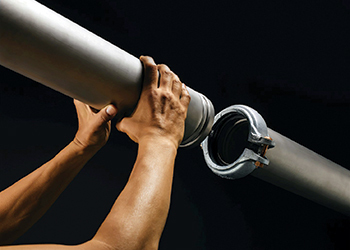 Victaulic, a world leader in mechanical pipe joining systems, says it has launched the first and only grooved pipe joining system of its kind: the StrengThin 100 system, designed exclusively for jobs utilising thin wall (2 and 3 mm) 304/316 stainless steel pipe. 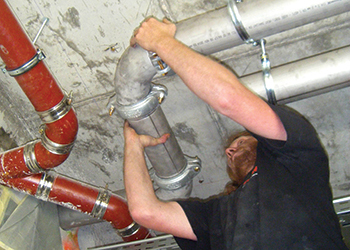 Thin wall stainless steel pipe joining is an attractive option across European construction markets, particularly for chilled water, cooling, air and potable water systems. It increases the efficiency of on-site material handling and lowers costs from a total installation point of view, says a spokesman for the company. “However, welding thin wall stainless steel isn’t without its risks. Overheating the pipe and the need for chemicals to pickle and passivate the pipe to restore its corrosion resistance are just two of the challenges associated with the welding process. To address these industry challenges, Victaulic listened to its customers and created the StrengThin 100 system, the only grooved mechanical solution for joining thin wall stainless steel,” he says. The StrengThin 100 system consists of a galvanised rigid coupling, featuring Victaulic propriety installation-ready technology. The coupling is rated up to 16 bar and suitable for temperatures ranging from -34 to +121 deg C. The rest of the system includes a full line of stainless steel, lightweight fittings and valves. The system also makes use of a brand new pipe groove profile, which creates coupling engagement without the risk of pipe flare. The system is available in sizes ranging from DN50 to DN150 for 2 mm wall 304/316 pipe. Sizes ranging from DN200 to DN300 for 3 mm wall pipe will become available later in the year. Meanwhile, Victaulic has recently introduced Victaulic Tools for Revit, an innovative Autodesk Revit MEP add-in that increases drawing productivity, solves troublesome pipe routing problems and enables the creation of construction and fabrication documentation within Revit. The application allows users to route pipe twice as fast and increase efficiency and productivity. The productivity tools within Victaulic Tools for Revit allow users to design virtual, intelligent models with all mechanical or pump room details in half the time compared to current routing techniques within Revit, according to the spokesman. The enhanced routing and editing tools enable the creation of complex piping systems with fewer clicks. “Victaulic Tools for Revit features an intuitive, user-friendly interface that simplifies training and usage for both new and experienced Revit users,” says Philip Janssens, manager Victaulic Construction Piping Services. “The add-in works in all views, comes preloaded with more than 100 Victaulic product families and template designs, and allows users to route with Victaulic as well as other manufacturers and joining technologies,” he adds. Contractors benefit from the efficiencies of using thin wall stainless steel pipe on their mechanical systems without the risks associated with welding. • Directory lookup: Scans family directories and imports and exports all lookup tables within all families. Victaulic Tools for Revit makes fabrication possible, while increasing productivity. Users can create construction details and fabrication drawings, including labour estimates and manufacturer information, without the need to switch software. Since 1919, Victaulic has been a leading producer of grooved mechanical couplings and pipe-joining systems that are used in the most demanding markets. The company has 15 major manufacturing facilities, 28 branches worldwide and over 3,600 employees. Victaulic mechanical pipe joining systems can be found in projects as diverse as the Alexandria Library, the Burj Khalifa and the Development of King Abdul Aziz Endowment (Dokaae). The company is also a member of the UAE Green Building Council and is involved with Breeam (BRE Environmental Assessment Method) and other international initiatives. Victaulic’s operational office in the Middle East is located in Jebel Ali, Dubai.